We put families first! We know that a positive dental experience for children is important to set them up for a life of healthy smiles. 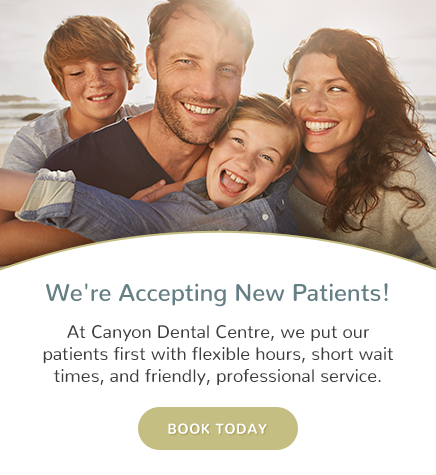 Visit Canyon Dental Centre, your children's dentist in North Vancouver. At Canyon Dental Centre, we often treat children as young as a few months old. We take pride in making children's dental visits as enjoyable and fun as possible. We welcome all children with a warm smile and accompany them to our chair, where they can watch TV during treated. We never force any procedure on kids, so they always leave our office having had a positive experience. Regular dental exams and polish to maintain oral health performed every 6 months on average. We go over flossing and brushing with them, so they get accustomed to proper oral hygiene care. First dental visits which are performed around the patient's first birthday. We then counsel the parents on diet and oral care regimen. We reward the children for cooperating at the end of each visit by a gift and a goodie bag. We look forward to seeing your children and showing them a fun time at the dentist!